Ever since I put together a birdwatching station in our library (which, to be totally honest, turned out to be more of a "sparrow-watching and coloring station") I've become obsessed with buying every more bird books for the library. While I love to find beautifully-written bird books, even better are those that are stunningly illustrated. This joyous alphabet book definitely falls into the latter category. The endpapers are an eye-searing neon orange, speckled with bird eggs and one tiny chick, who pops out of the shell to produce a "this book belongs to" speech bubble. The neon orange is repeated in little hints throughout the illustrations, from the underside of airplanes, joining albatrosses in the skies to the flowers visited by the hummingbirds and their ruby throats. They get around the difficult letters of the alphabet by using ultramarine for U (kingfisher, flycatcher, and lorikeet) and V for a goose flying formation. The illustrations are colorful and have a modern, smooth style that is fun to look at. I could definitely see these pictures making excellent cards or a fun board book, a la Charley Harper. In fact, there's quite a bit of similarity between the styles, although there's more variety and fanciful color in Walker's art. I'm a little disappointed by the text, which I found rather pedestrian. I'm generally not a fan of rhymed picture books and the rhyming couplets felt forced and heavy-handed to me "N is for nightingales who sing us to sleep, and for nuthatches who bore into trees deep." However, the lovely illustrations make up for deficiencies in the text and families will enjoy poring over the book together. Verdict: There are a lot of alphabet books out there, but the gorgeous art of this one sets it apart, even if the text is not particularly memorable. 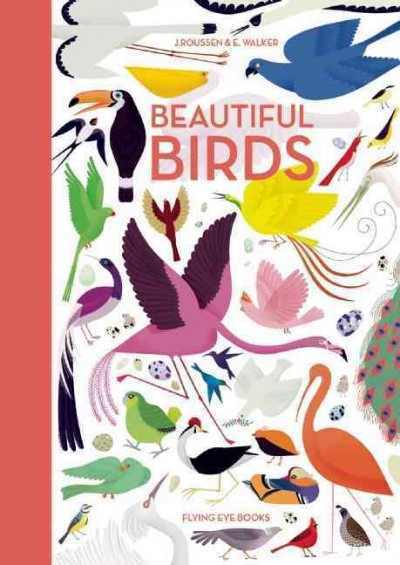 An excellent addition if you are looking to add to your bird or alphabet books. Recently, I've started working on improving the middle grade and young adult nonfiction sections of my library. This can be difficult for me, since I've gotten into the habit of expecting high circ numbers from every book I buy. I have a relatively small budget and I have high expectations of my purchases. But nonfiction is, realistically, going to have smaller circulation numbers. Fewer kids are encouraged to read nonfiction, they often need a higher reading ability to understand the more complex vocabulary, and in my library it's not as easily accessible as the fiction. This is a great gateway book to get kids who are used to only fiction interested in reading nonfiction. It has an interesting storyline, a mystery, and a very practical approach to research. In the midst of the Great Depression, on a hot summer day in 1944, the circus was in town in Hartford, Connecticut. 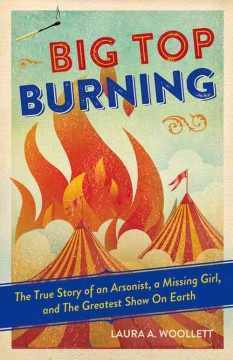 Packed crowds arrived for a rare day of fun but it ended in disaster and tragedy when the circus tent caught fire. 167 people, many of them children, were killed. In the aftermath of investigation and grief, the bodies of two girls were never identified and another girl was left missing. Arson investigators declared the fire to be an accident, but many clues pointed to a human agent in the tragedy. Throughout the following years, many different people investigated the fire, trying to identify the unknown bodies, the missing girl, and the criminal, if one existed. The author finishes with a summary of the most recent conclusions and some thoughts on the changing nature of research. Copious notes, bibliography, further reading, and credits are included. This is well-written and strikes a nice balance between a steady flow of facts and creating an interesting narrative. Even if kids don't get interesting in starting their own historical research projects after reading this, they'll enjoy following the clues and historical tidbits. Although it's a sad story, it's presented respectfully and honestly, without too many gruesome details or horror. Verdict: A great addition to your history section, whether you are a public or school library. This might need a little extra booktalking, as nonfiction sometimes does, but with a little promotion I think it will be popular. Recommended. So far, most of the library data and reflections that deal with areas of my library and circulating collections, have been those of unaparallel success. Heh. Today I'm going to talk about one that I'm still not 100% happy with, but which turned out to be the best we could do at the time and we are getting used to it, or so circulation numbers say. About two years ago, in preparation for changing the picture books to Neighborhoods, I revamped the juvenile fiction. I wanted more space for picture books and to make a natural progression from picture book to easy reader to chapter book. I wanted to integrate the graphic novels with the fiction, since many kids were going straight to the graphic novel shelves and ignoring the rest of the chapter books and there are many authors who are doing more graphic blends and a variety of formats. I also wanted to make the paperback series more specifically beginning chapter series, and not just "whatever happened to be paperback" series. But, what to do with series that had no specific author? American Girl, 39 Clues, Superheroes, etc. We finally decided to have a "favorites" section at the beginning of the juvenile chapter books, replacing the graphic novels. This has been of mixed success. A lot of kids still go straight there looking for superheroes, Star Wars, etc. It has been rather confusing for shelvers to remember that items without the normal 3 letter call number go here and not back in the regular chapter books. Because it's where the graphic novels used to be, and because many of the favorites are graphic novels, a lot of kids think these are the only graphic novels we have and the constant cries of "Where is Bone?" can get a bit exhausting. However, people have slowly figured it out and juvenile circulation has climbed back to its former numbers and even grown a little, slowly but surely. The display thingy in the forefront is where all the new juvenile fiction goes. It has its own location to assist staff in finding titles for picks and circulates really well, especially in summer. The diver feet on the floor lead to easy readers on the right and favorites on the left. This is part of the favorites section, with logos listed on top. This is mainly for adults, since most kids aren't tall enough to see them.Some favorites, like Hello Kitty, Power Rangers, etc. only have a couple volumes and my ultimate goal is to either add to or clear out these minimal ones. I finally got labels on the paperback series. I plan to add pool noodles to keep them from squeezing to the back. The diver feet come out and point towards our big beginning chapters display. Eventually we'll change this over, but we've had it up since April and it's gone quite well over the summer. It's not an ideal place for a display, but it's better than where it was before. Also, it's fun to listen to little kids quack as they follow the "duck feet" every day. column. So, have a butterfly. The weather was weird, my garden got slugged again, but a gazillion people came to the library, I got licked by a friendly Great Dane and it was all awesome. Lest you think that my library looks like it did in all those pictures of cool displays at the beginning of summer, I include what we now look like at the halfway point below. Actually it looks rather worse, but I took pictures after we'd been shelving and tidying for several hours. Finished thank you letter and grant for continuing funding for circulating toy collection. Finished going through the parenting collection - updating call #s, pulling items for the neighborhoods. Mad Scientists Club: What floats? What flies? The superhero hideout has been attacked by super villains. We took off the tower to start over. It's been a long, long time since the first Maybelle book, Maybelle in the Soup, came out and was a surprise hit with my patrons. The last Maybelle book came out in 2012 and I'd given up seeing any more until I saw this at ALA and was assured by the publicist that it really was coming out. 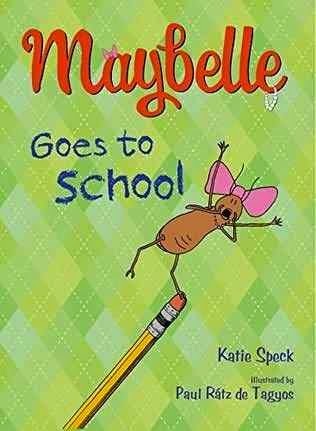 In this, the fourth book of Maybelle's adventures, Maybelle the cockroach and her friend Henry the flea inadvertently go along for the ride to the first day of school when they sample Mrs. Peabody's massive ten layer cake and end up visiting the school bake sale. Hijinks ensue, from frantic bug-chasing by the humans to Maybelle's efforts to keep track of Henry (and his pants). Finally, everyone makes it home and safe and sound and Maybelle vows to never fall asleep in a cake again...until next time. The art in this galley was incomplete, but there are enough black and white drawings to get a sense of Tagyos' humorous line art and how it fits into Maybelle's wacky adventures. The larger-than-life characters have exaggerated facial expressions and lumpy Henry and sylph-like Maybelle are cute and bug-like without being too insectish. My main concern with this is that it's been so long since a Maybelle book came out. For a beginning chapter book series, three years is, literally, a lifetime. The original Maybelle fans moved on within a year or two at most and purchasing the newest book in the series means having to start all over with building a fan base. While this book can be read on its own, it will make more sense if you've read the prior books and know who Maybelle and Henry are, their previous adventures, and the general tenor of the series. However, it looks like the three previous books are being released with updated covers to match the latest book so now could be a good time to start with the whole series if you missed it the first time around. Verdict: This wouldn't necessarily be my first choice if I had a very limited budget for beginning chapter books, but it's definitely a recommended series, being funny, easy to booktalk, and I know it was an easy sell for kids before so probably will be again. This is another board book that would have worked better as a picture book. 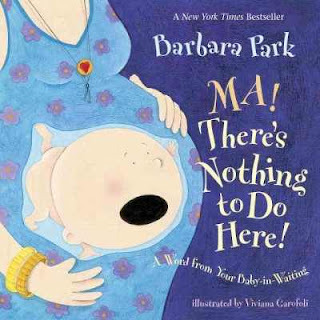 A baby complains about how boring it is inside his mom and imagines all the things he could be doing. Finally, he realizes he needs some more time to grow but promises he'll be coming out soon. The drawings are dominated by the baby with its giant head. Most of them are fanciful, but the baby has an umbilical cord more or less and the final picture shows him sliding down a twisting chute to be born. It's very busy and text-heavy for a board book and is likely to raise questions about the birth process, if that's a concern for your parents. I can see older kids and adults finding it very funny, but it's all wrong for a board book audience. Verdict: This should never have been adapted to a board book - it's a picture book story both in complexity of text and illustrations and in subject matter. I seem to be seeing more and more picture books adapted to board books when they don't work in that format at all. I don't know if this is something mainly done by Random House or if I just review more of their books. Marianne Dubuc's deceptively simple, understated art offers a chance to explore both story and imagination and this new title is no exception. Clara is very excited to be taking her first solo bus ride. As the bus travels, she quietly observes the changing scenery, including the different animals that get on and off the bus. As they pass through a tunnel, Clara interacts with new friends, and finally arrives at her destination, there many subtle changes in the scenery and passengers. A sharp-eyed reader will pick out the details, as well as the fairy tale hints in the various characters. Dubuc's soft pastel pencils are enlivened with spots of color; red cheeks, clothes, an apple, and accessories. The rectangular design enforces each picture, which mostly take place on the bus itself. The simple background scenery is almost unchanging, focusing the reader's attention on the activity within the bus. Verdict: The simple story and almost drab illustrations are unlikely to make this a storytime hit, but with a little more time and a thoughtful reader, the details and tiny shifts in the story shine through and will make this a favorite for a special child. An additional purchase if your budget is limited, but if you are looking to fill your quotient of special books for specific children, something I try to add a few of every year to balance out all the Pinkalicious and Disney, this should definitely be on that list. I picked up a whole stack of random nonfiction as I'm getting ready to do a major overhaul of the juvenile nonfiction. This is pretty random - it's one title from a set of books about everyday inventions. 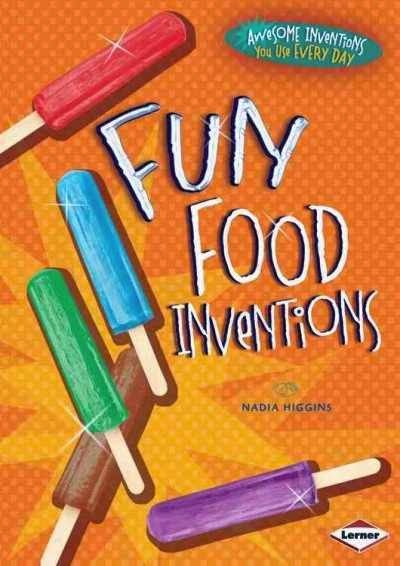 After a quick introduction, the book jumps straight into the invention and evolution of a number of fun or funny foods. Some, like ketchup, talk about the slow changes over time in a recipe. Others, like bubble gum, were created by accident. Creations like the doughnut hole, are legends that nobody quite knows the truth of while microwave dinners required lots of different inventions and experimentation. Each story is told in one page, while the facing page has a photograph of the inventor and/or the food. A few extra fun facts are sprinkled around the edges. Back matter includes a glossary, some books and websites for further information (these are really random, ranging from cookbooks to websites about food myths, to a book on how ice cream is made) brief index and a handful of source notes. Verdict: This is really not what I was looking for. There was no clear differentiation between fact and fiction and the limited source notes make me skeptical of the history of the different foods. The cover isn't very attractive - something with photographs and less eye-searing color would have been better I think. I wanted something more factual. Week 2. My garden has been SLUGGED. This weekend the WAR will commence. This was actually a fairly quiet week, in between bouts of reader's advisory, field trips, and programs. I tidied the magazines - relabel boxes etc. Request for nonfiction and scary books for a ten year old I picked out Into the Unknown and Haunted Histories. Recommendation for a middle school boy I know. I showed him John Feinstein, but then I thought of my all-time favorite, Bad Day for Voodoo. Two middle school girls I recommended Patricia Wrede's Enchanted Forest Chronicles, Sorcery and Cecelia and then a younger girl who was listening I gave Suzanne Selfors' Imaginary Veterinarian. Rules by Cynthia Lord - checked out. I recommended Battle of Darcy Lane instead. There aren't a lot of authors who I unreservedly trust to write books that I will love every time, but Ursula Vernon is one. I've been agog to read her newest book, as it's a departure from her previous series and oh, how I loved it. Castle Hangnail is in dire straits. If they don't get a Master soon, the Board of Magic will decommission the castle and the minions will have to leave their home. But when an applicant for the vacancy shows up, declaring she's a Wicked Witch, they're a little...skeptical. She's awfully....short. And young. And is she really wicked? Or a witch at all? But Molly slowly becomes part of the castle, turns out to have some quite impressive magic, and it seems like everything is working out. Until Molly's secrets are revealed and the minions have to make some difficult choices. I seem to be reading a lot of books about twelve year old girls and their growing pains recently. This doesn't have the poignancy and realism of My Life in Dioramas of course, but it nonetheless strikes home on some universal feelings and struggles of pre-teens; finding a place where you fit in, difficult friends, self-confidence, and having the courage to admit mistakes. There's also a voodoo doll with a pet goldfish who sews exquisite clothes, a donkey who sometimes turns into a dragon, and lots of gardening hints. Ursula Vernon fans will recognize many of the characters in the spot illustrations from works she's done over the years and fall in love all over again with her artwork, especially tough, quirky, sturdy Molly. The acknowledgements mention Eva Ibbotson several times and I can definitely see her influence in this book with the emphasize on discovering your place and true friends and making characters that are often considered window-dressing, like minions, the pivotal personalities of the book. 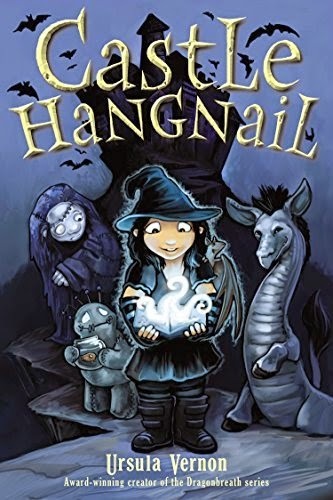 Verdict: Just as Molly discovers, Castle Hangnail isn't for everyone - but for those special readers they'll fall in love and never want to leave. Hand this one to your readers who like funny fantasy and are starting to also want things that probe a little more deeply into thoughts and feelings. I'd recommend it to fans of Ibbotson, except I unfortunately don't have any. This is one that will be easy to booktalk though and will find new fans wherever it goes. Recommended. Scholastic has a confusing variety of reading levels under the umbrella of "level 1". This title includes the "50-250 words" logo, which means it has more complex vocabulary, but compared to some other titles under this level that I have read, the sentences are very short and simple. 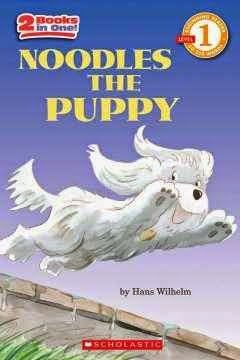 This paperback includes two stories about Noodles, a fluffy, friendly puppy. I Won't Share! has a pretty typical plot. Noodles doesn't want to share his squeaky toy with the other dogs, but then realizes sharing is more fun and they all enjoy it together. I Am Brave! shows Noodles facing his fears about storms when he gets stuck on the porch during a storm. As he watches each part of the storm; rain, wind, thunder and lightning, he enjoys the power of the storm and enthusiastically congratulates himself on his own bravery when it's all over. Wilhelm's art focuses heavily on the cute and there are lots of pictures of the adorably fluffy Noodles romping about the pages with flapping ears. The backgrounds are white or washed over in soft pastels. This can sometimes make it difficult to find the words, which are in a smaller font (for an easy reader). Since there are only a few words - no more than two sentences - per page, they sometimes blend into the artwork. Verdict: Many of the Noodles titles are still available as paperback or prebound. The difficulty of finding the text makes these an additional purchase in my estimation. If you have really strong fans of Biscuit and Mittens and are looking for additional titles in that vein, these could be worth purchasing. Generally, I've found I prefer Child's Play's board books to their picture books, but this one fills a niche very nicely and has adorable illustrations as well. When Ice's mother tells her they are moving to a land far away, Ice is not happy. She is scared and worried about leaving all her friends. Her new home is very hot and strange and she doesn't understand anything the other children say. The other children make some overtures, but Ice is overwhelmed by the differences in her new home. Only when her new school makes an effort to understand where she comes from does Ice start feeling at home and settling in. The illustrations have a friendly, warm feeling with rich colors and thick lines. The facial expressions of most of the animals, except for Ice, are limited but that keeps the emphasis on Ice's emotions and struggles to settle in to her new home. Verdict: This is a sweet read-aloud on its own, but it would also make the perfect story to read to children welcoming a new classmate or getting ready for their own move. 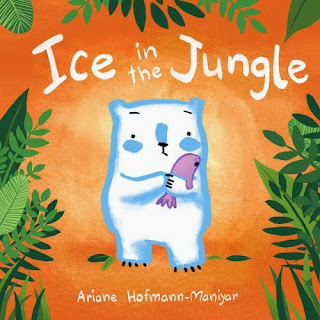 It's a gentle introduction to empathizing with someone who comes from a different culture or background and, although simplistic, is at a good level for preschool children to understand. Recommended. This is one of five titles in the "Pet __ up close" series, part of the Pebble Plus family from Capstone. In the past, I've really not liked these titles - too expensive for the extremely limited amount of text, uninspired photographs, etc. but they're offering new titles and what looks like a makeover of the covers, so I thought I'd give it another chance. This title keeps the same oversized rectangle layout, but has a more colorful, attractive cover. There is a note to parents and teachers that this supports various curriculum standards and a table of contents before the book begins. 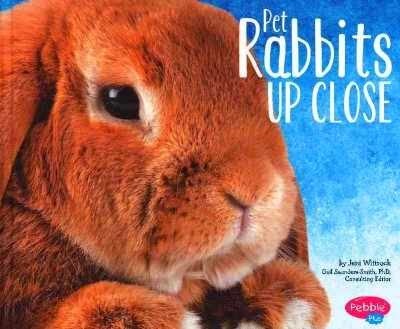 The first chunk of text introduces the reader to rabbits and explains that this book will examine their different body parts. Each spread features a different part of the rabbit with a caption and an average of 3 sentences on the left, in a bold, large font. On the right is a large color photograph, which is spread across the gutter and bordered with a blue and white design. The subjects include ears, eyes, nose, teeth, whiskers, feet, fur, and tails. Tails doesn't quite fit in with the rest of the pages, since all the other ones focus on how the body part helps the rabbit survive and thrive and tails just says "Short, round, and fluffy, bunnies' tails never get in their way." The back matter includes a short glossary, 3 titles for further reading (one of which must be an error because it's about cats) and a link to Capstone's curated websites, FactHound. There is also a short index. Verdict: Still not impressed. I don't like the way the photographs are split across the gutter. I like the new ABDO titles better - they seem aimed at a more picture book audience while these are still being pushed as easy readers although the layout is all wrong for that age group. Easy readers should be vertical rectangles, everyone knows that! I can see that these would be useful in a curriculum context, but I can't justify the cost of these and the paperbacks are too flimsy. If it's a subject I really need and these are the only option I'll go with them, but there are plenty of better books about pets. I have mentioned these before, but I wanted to do a sole post on them. Because they are cool! I got this idea from another Wisconsin library a friend told me about. Mukwonago maybe? Anyways, they had maker kits with things like making play-doh, etc. That sounded a little too messy to me, but I came up with my own kits. Then I applied for and won a nature discovery backpack from the DNR and added that as well. So, the way they work is that there is a list of items clearly posted on the tub. These are the things that "belong" to the tub. Everything else is a consumable and can be used up. I had these shelved back on our maker shelf, but that is gradually being shifted over to teen materials and I was having issues with things getting lost in the library so I added the "please do not open in the library" signs and moved them over by the toy bags, where they are much easier to find anyways. The maker kits (excepting the backpack) are shadowed in the catalog so they cannot be placed on hold. This means I don't have to stress about getting them refilled asap when they are returned and also about losing pieces in transit or at other libraries. Includes books, cards, pamphlets, bug house, etc. over 30 pcs in all. DNR replaces missing/broken items free of charge but so far all we've broken is the bug house! Consumables - fabric, felt, thread, buttons, yarn, etc. Consumables - fabric, felt, etc. Consumables - worksheets, coloring pages, stickers, etc. Right now I am putting some of our Wii gaming controllers into kits to check out and I'd like a birdwatching and Snow Fun kit at some point. Last year we had two pools that were supposed to be pizza gardens and pumpkins in the walled garden. It was freezing cold most of the summer and the walled garden dirt turned out to be less than it could be and we got nothing much but a few tomatoes and 1 small pumpkin, very late in the summer. This year, we were supposed to weed and plant on May 20. It was about 30 degrees. We finally got the plants to use at Go Go Garden and it was pouring rain. So I got my aide and we planted on Saturday. A little at a time and hopefully the gardens will improve slowly over the years. I thought this bare spot would be nice to put a couple tomato plants, as soon as I scraped off the rough gravel on top. And the gravel underneath. And underneath that. When I got down about a foot and a half, I gave up, dumped some potting soil in, and shoved the plants in. Whatever. We left the empty half of the walled garden empty while we were waiting for vegetables and then last week someone from the city showed up (without any communication) and planted a bunch of unwanted flowers. Uh....whatever. There was still space left, so we shoved the squash plants and a bunch of bean seeds in there. I have doubts about the drainage qualities of these pots, but it's too late now. They have tomatoes and the pool has 2 squash plants and some bean seeds. From the sidewalk. The city did bring us a bunch of bags of dirt, so all is forgiven. I'm going to use the rest for our planting programs. That railing and bushes hide a staircase down to the basement and the door leads to the landing on the stairs going to the basement. Someday, we plan to turn the bare spots to the right into a butterfly garden. The walled garden outside the storyroom. The door is an emergency exit. We plan to have storytimes and programs here, picnicking under the tree, etc. but there's no fence and a busy road right behind the sidewalk, so we're going cautiously. Summer reading has fully begun. By the end of Monday we had over 500 kids registered. This is due in large part to my assistant, who I skillfully scheduled at the most busy times of the week...it has been a pretty easy kick-off, as these things go but I have still gone over my "Celebrating the Chaos" post from last year a few times! This year is, overall, going so much more smoothly. Fewer programs, fewer big extravaganza programs - I feel like I should feel frantic, but there's no reason to! School group came on Wednesday. About 35 kids, beautifully behaved as always. I got them signed up for summer reading and helped with lots of book requests. Next year I'm going to work on the biography collection. Thursday we had a slow start to Lego Club, the weather is a bit iffy, but 44 people came overall so that was quite enough, even if it's nothing compared to last year. Friday was crazy busy. I left around 4 and then came back Saturday to handle more busy and get the planting (finally) done. Where are the Cirque du Freak books? Mustache Baby and "making" books (from school visit) all checked out - gave her Mo's Mustache, Mustache by Mac Barnett, and Chloe's Lion. Parent-defined reluctant reader who only likes Minecraft and Wimpy Kid. Recommended the Minecraft novels (which are checked out), Nick and Tesla, and DK Adventures. Allie Condie's Crossed - mysteriously missing. Beginning chapter mysteries (didn't phrase it this way - child was reading Hardy Boys and it was too hard) gave them Buddy Files. Teen novel nobody in our system owns, something horror-ish? I made a note to purchase and put it on hold. Still waiting for the 7th Wings of Fire - not out yet. Struggling reader - had them read a sample of an easy reader and then picked out a number of beginning easy readers. Really need more of the very beginning ones. I rarely review sequels, but I really wanted to preview this before purchasing it for the library and the only other library in my consortium which owned the first book promptly lost it. So, when I had an opportunity to review the second book I decided to just go with it. Mr. Pants, an orange and white cat with two differently-sized eyes lives with his sister, gray cat Foot-Foot and their youngest sibling, little white cat Grommy. The three of them live with their human Mom and act rather like real children. Mr. 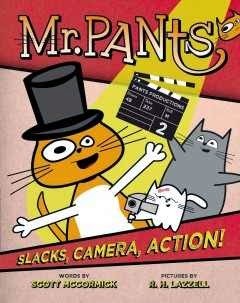 Pants wants to make a movie and win a contest, but first there are chores to be done and then things keep going wrong! Will he ever get his movie made? Will they find out the end of of their bedtime story about Bum-Bum and his adventure riding the Vuumba? Who will win the game of "Honestly" by making Mom say "Honestly kids!" first? The art felt very flat and digital, which worked really well with the odd storyline and wacky characters. It took me a little while to get used to the tilted perspectives and panels which sometimes felt cluttered to me, but I think kids would adapt to this a lot more easily than I did. This wasn't my personal favorite, but I did find parts of it quite funny. Verdict: The flat, cartoon art coupled with the nonsensical storyline made me think of a lot of contemporary cartoon shows for middle grade kids and I think fans of Adventure Time and similar shows would definitely go for this. It's also got somewhat of a Garfield vibe to it as well. I'd definitely recommend adding this to your graphic novel collection. The title of this looked awfully familiar; I must have seen mentions of it somewhere, but I didn't end up purchasing it as all my attention was focused on Neighborhoods for collection development. This is the story of Little Big Horse. He is waiting anxiously for school to end so he can ride his bike. But when he races outside, his bike is gone! Pablo the bully (who also happens to be a bull) has taken his bike. 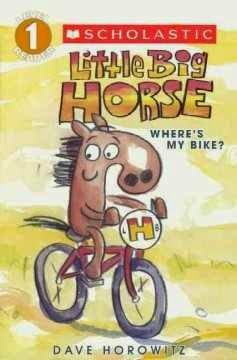 Little Big Horse is dejectedly walking home when he discovers Pablo and his, now broken, bike. Turns out Pablo doesn't know how to fix a flat tire. Two fixed flat tires and one apology later, Pablo and Little Big Horse ride off into the desert. Horowitz' watercolor caricatures are humorous and accessible. The characters have expressive faces and broadly memorable features. The text is shown in a large font with lots of white space around almost every sentence, keeping the focus on the words. This is a good illustration of how utterly confusing publisher "levels" can be. Scholastic has several different "level 1" titles. Some have a small logo reading "50-250 words" which are much more complex. Others, like this one, have just a few words or one sentence per page. Verdict: Maybe I'm just tired, but I don't really see where the humor comes into this - it's not exactly giving useful instructions on how to handle a thief or bully, since their reconciliation happened entirely by chance. The art has a cartoon feel, but nothing that said "funny" to me. An additional purchase. I usually am not much of a poetry fan, but this galley (which was accidentally sent to our cataloger from whom I stole it) had eye-catching pictures and I couldn't resist it. 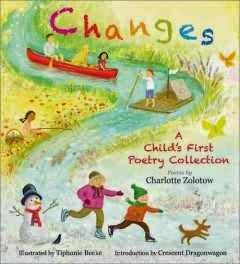 This is a new edition presenting 28 poems by Charlotte Zolotow. The table of contents has an introductory poem under "Celebrating the Seasons" and then divides the rest into the four seasons, with large, colorful thumbnails marking each section. The introduction, by Charlotte's daughter Crescent Dragonwagon, talks about the beauty of Charlotte's poetry and her legacy. The introductory poem is bittersweet; it talks about how the seasons are the same every year, but "It is only I/who have changed." "Spring" includes poems on the river, the wind, watching a bird as you lie in the grass, and several on flowers. "Little crocus/like a cup,/holding all that sunlight up!" "Summer" felt more generic to me with poems about feelings, colors, the ocean, a bridge on a summer night, and insects. "Autumn" focuses more on the season, changing leaves, school, and two poems on Halloween. "Winter" focuses on snow, ice, and waiting for spring. One short poem stands out to me, "Scene" which reads "Little trees like pencil strokes/black and still/etched forever in my mind/on that snowy hill." The artwork reminded me a little of Jana Christy's soft, fuzzy scenes but while the backgrounds had those same softly glowing colors and blurred edges, the people and animals that populate the book are drawn with clear lines and bolder colors, standing out against the softer backgrounds. Although the poems and art generally picture a specific area - typical four seasons geography - the children pictured are diverse. I think they're the same six children on the cover, shown in different clothes and settings throughout the book, but I'm not obsessive enough to compare each one to be sure. Verdict: Although poetry generally doesn't circulate well in my library, poetry cleverly disguised as picture books can be sneaked into the picture book section and seasons are always a popular topic. This is a lovely collection of beautiful, accessible verse that parents and children alike can enjoy and, if cataloged and marketed well, should circulate briskly. Recommended. I've never been a really big fan of Karas' art (I know, I know, everybody else loves it) but this is one book I can really get behind. The story begins long, long ago with a little Native American boy dropping an acorn into a whole. In 1775 (the date is neatly blocked out at the bottom left corner) the tree sprouts. The tree grows throughout history as farmers take over the land, through heavy winters and hot summers, the coming of the railway and electric light. Cars appear on the roads, and a treehouse is built in the tree. Finally, when the tree is 225 years old, a final great storm splits the tree in two and its life is over. The last spread shows a large stump against a bold green background and, next to the stump, a little sprout as the cycle begins again. A final page includes some simple facts about the life cycle of an oak tree. A poster is included in the book as well. One side shows how different historical events correlate to the rings in the oak tree, the other side has various activities. 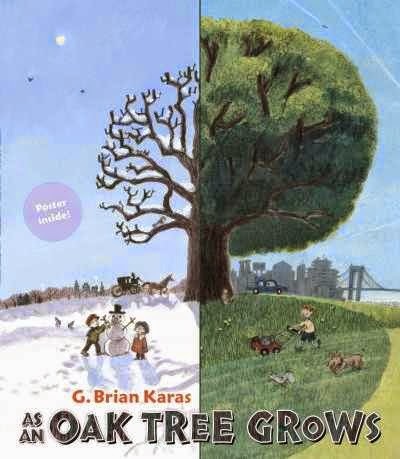 Karas' smudgy, detailed art has a wealth of diverse people featured throughout the story, from the original boy who planted the tree to the families living and working around the tree in the ensuing spreads. Having recently been reading several nonfiction books, specifically picture book biographies, that were not at all suited to their audience, it was like standing under a refreshing waterfall to see this book. On the face of it, it's a very simplistic approach to history through the growth and changes in a tree, perfectly suited to a very young audience. However, the genius of this lies in the detailed art that allows parents and teachers to initiate discussions on the historical events as they are occurring; why did the Native American boy leave? How is the land changed with the advent of various technologies? What different people do you see? How are they the same? How are they different? Verdict: This is a great book, not just in literary and artistic quality, but in the connections it opens up for further discussion and research. This will be accessible for a wide variety of ages and interests. Highly recommended.